Description HellermannTytons Category 6 product range is designed and manufactured to offer exceptional performance and reliability, supporting any voice and data protocol capable of running over a Category 6 system. Available in 1U 24 port and 2U 48 port presentations. 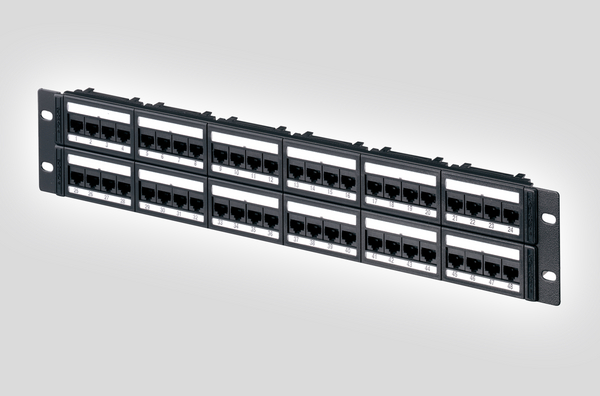 Each panel is constructed of 6 modular units, each offering 4 RJ45 ports. There are two labelling fields as standard with a magnifying lens for clear identification. Each panel is supplied with Rack Snap fixings as standard. 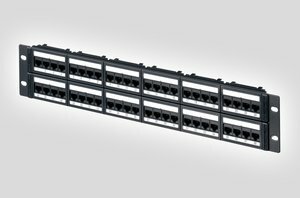 Technical Description The Category 6 Patch Panel is manufactured from black powder coated mild steel with a 4 port modular PCB assembly jack presentation which can be removed and replaced if required. Each PCB module is tested to exceed the latest published versions of ISO/IEC 11801, BS/EN50173 and ANSI/TIA/EIA 568-C Category 6. Each panel is supplied with a comprehensive T568A/B wiring guide label on the rear of the modules to ensure error free terminations. Category 6 panels are also backwards compatible and will support cat5e & voice applications.